Due to bad weather conditions on Friday, 1st March, we had to abandon some of the the scheduled matches. The same has been rescheduled for Friday, 8th March at the Agility Grounds, Sulaibiya from 7 am onwards. Good News for Cricket lovers! 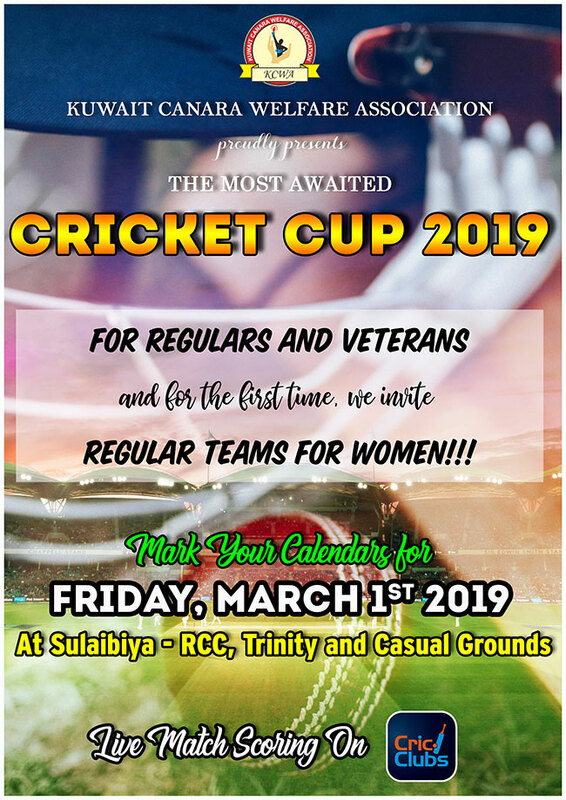 We are pleased to announce the “KCWA CRICKET CUP 2019” which will be held on Friday, 1st March 2019 at Sulabiya (Trinity, RCC & Casual) grounds. The tournament will be held for Men’s (Regulars & Veterans). Women’s Regulars will be introduced for the first time. It gives us immense pleasure in inviting KCWA Members to this exciting tournament and we look forward to your teams’ participation with the best of sportsmen spirit, enthusiasm and zeal for glory. KCWA members and their spouses and children are eligible to participate. Membership renewal for the year 2019 is a must. Registration fee KD 20/- (non-refundable) per team; should be paid along with the filled-in registration form. The tournament will be held on a full-fledged cricket ground. Players are requested to wear the team uniforms or white cricket clothing. The rules and regulations will be communicated to the registered teams. Last date for Team Registration: Friday, 15th February 2019.